Biliary cast syndrome (BCS) is reported after liver transplantation, but is rare in a non-liver transplant setting. Though it is associated with ischemic type injury, it may also occur with a normal arterial inflow. BCS has a multifactorial etiology and its management is difficult due to late detection. Here, we report a middle-aged diabetic patient who developed BCS and was managed surgically. 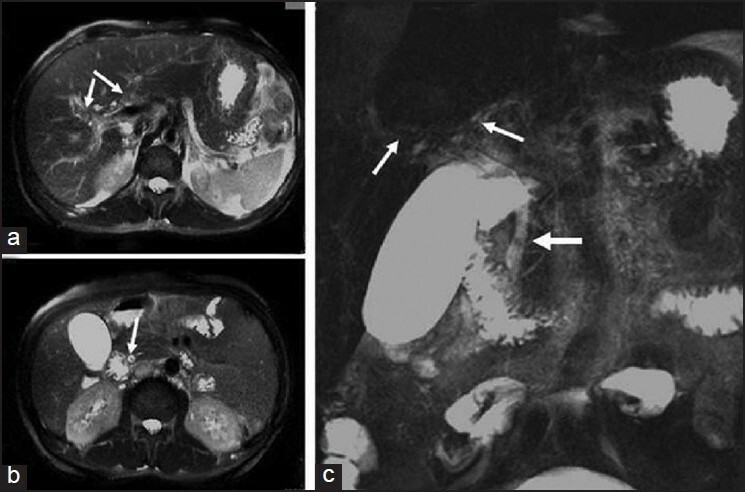 A 54-year-old male presented with recurrent cholangitis with jaundice and pruritis of four months duration. He had lost significant weight. He was a diabetic and on oral hypoglycemics. He had undergone angioplasty two years back for ischemic heart disease (IHD). His biochemical profile revealed deranged liver function tests (Serum bilirubin - 8.3 mg/dl, direct bilirubin - 5.6 mg/dl, SGOT - 64 U/l, SGPT - 72 U/l, alkaline phosphatase - 355 U/l). Ultrasonography of abdomen (USG) showed mildly dilated intrahepatic biliary radicals (IHBR), distended gall bladder and sludge in the proximal common bile duct (CBD). Magnetic resonance cholangiopancreaticography (MRCP) showed T1 hyperintense and T2 hypointense linear filling defects in the right and left hepatic ducts extending into the common hepatic duct (CHD), and a calculus in the lower CBD [Figure 1] and [Figure 2]. In view of the MRCP findings suggestive of a worm in the CBD as the cause of cholangitis, endoscopic retrograde cholangiopancreaticography (ERCP) was attempted with a view to extraction. However, it failed on two occasions due to failure of cannulation. Thus, surgical drainage was planned for relief of cholangitis. At exploration, the CBD appeared dilated (8 mm) with a distended gallbladder. 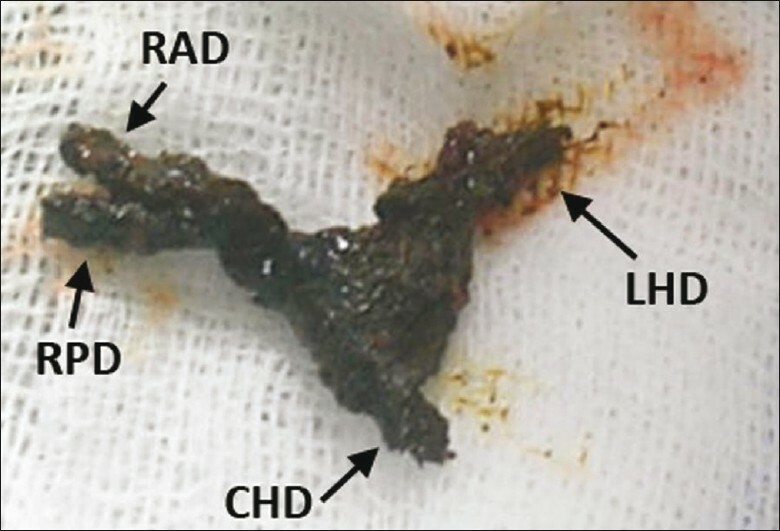 Choledochotomy revealed bile sludge and a biliary cast lying in the proximal CHD, branching into the right and left hepatic ducts with involvement of second-order ducts. The cast was extracted in Toto and intraoperative choledochoscopy was done to confirm complete bile duct clearance [Figure 3]. The biliary epithelium appeared normal. Cholecystectomy with Roux-en-y choledocho-jejunostomy was done. The postoperative period was uneventful. On follow-up for 12 months, patient remains asymptomatic. In patients with recurrent cholangitis, in the tropics, linear filling defects, seen on MRCP, are usually due to parasitic infestation of the biliary tree. BCS is the presence of casts anywhere within the biliary system (intra- or extra-hepatic), causing obstruction with resultant biliary infection, stasis and cholangiopathy. Though it is known to occur in liver transplant patients, it is seldom seen in the non-transplant setting. The incidence, after liver transplantation, ranges from 3-18%. The exact etiopathogenesis remains uncertain but it has been observed that anything which increases the viscosity and/or decreases the flow of bile, may precipitate cast formation. Some of the proposed mechanisms include acute cellular rejection, ischemic injury to the bile duct, biliary infection, fasting, prolonged ICU stay, parenteral nutrition, abdominal surgery, head injury, drugs (cyclosporine), foreign body (T tube, stents) and any cause of super saturation of bile with cholesterol. In a transplant setting, prolonged cold  and warm  ischemia time have been described as predictive factors of BCS. Our patient had episodes of fasting (religious reasons) and probable ischemia due to atherosclerosis. The differences of all reported non-liver transplant patients with BCS underscore its multifactorial pathogenesis. The sludge in BCS can be in the form of a cast, as in our case, hard like a calculus or it can be thick inspissated debris. Biochemical analysis of biliary casts in liver transplant patients has shown either unconjugated bilirubin (10-15%) in cases of delayed BCS (six months to 5 years post-operative.) or solid casts in the bile duct consisting of connective tissue and biliary duct epithelium. However, the chemical composition of biliary casts in non-liver transplant patients is unknown. Unfortunately, in our case as well, biochemical analysis of the cast was not performed. Due to considerable increase in the success rate of endoscopic procedures, ERCP is now considered as the treatment of choice in patients with infestation, where it has a high success rate. However, if it fails, as in our patient, BCS should be considered due to the intrahepatic branching of the cast. Surgery is indicated when endoscopic management fails. Surgical repair involves bilioenteric anastomosis with extraction of biliary sludge from the larger ducts. Intraoperative choledochoscopy should be used to ensure complete removal of the casts. Our patient had significant branching of the cast from the proximal CBD into intrahepatic second-order ducts. In conclusion, biliary cast formation should be suspected in patients with recurrent cholangitis, when linear densities are seen on MRCP. This is especially so in the tropics, where worm infestation is well described. However, endoscopic intervention, which would be the procedure of choice for worms, may not work for patients with BCS who are likely to need surgical intervention. 6. Valls C, Alba E, Cruz M, Figueras J, Andνa E, Sanchez A, et al. Biliary complications after liver transplantation: Diagnosis with MR cholangiopancreatography. AJR Am J Roentgenol 2005;184:812-20. 8. Schwarz J, Simsa J, Pazdirek F. Our experience with peroperative choledochoscopy. Rozhl Chir 2007;86:180-3. 14. Dziurkowska-Marek A, Hartleb M, Marek TA, Nowakowska-Dulawa E, Kaczor R, Ciupinska-Kajor M, et al. Fatal case of biliary cast syndrome in nontransplant patient. Endoscopy 2009;41:e256.